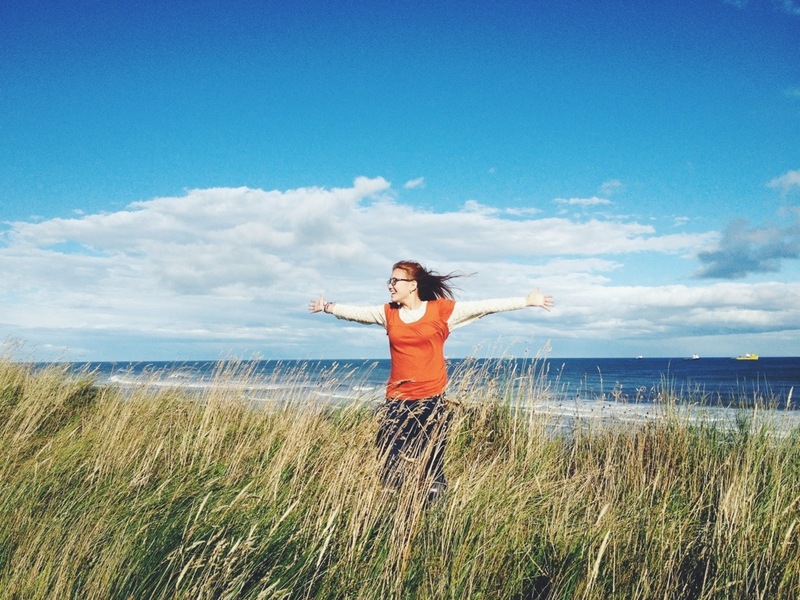 I took this picture of Mary Polly in September 2013, less than a month after we moved here, and it pretty much captures how I feel about the Sand Dunes in Scotland. The wind is always blowing the grasses that grow on the sand dunes so that you feel like you’re in the middle of filming an epic film about an ancient homeland. Also contributing to “epic film feeling” is that there is no one around. You have these giant playing fields full of sand and grass almost entirely to yourself. Soon you are either battling enemies or singing loudly or just running wildly and thinking you are the star of life. Because, come on! It’s gorgeous. And the sea is right around the corner. I get this little excited feeling every time we walk these boardwalks before we glimpse the sea. What will we find today? The wind in my hair, which is cold and makes me wrap my scarf around my face but is still exhilarating. A rock or a shell or a piece of beach glass that I put in my pocket and later put on the window sill of my bedroom. Kids who remember how to run and who are not afraid to get their feet wet in absurdly cold water. Kids who do not mind getting covered in sand, rolling down hills and covering themselves with sand that I will later find all over everywhere and it will annoy me but also remind me of very good days. Pretty much the whole coastline of Northeast Scotland is covered in these sand dunes, but we have a few favorite spots for sure. We have recently discovered Newburgh Beach where you can see hundreds of seals right at the mouth of the Ythan River. 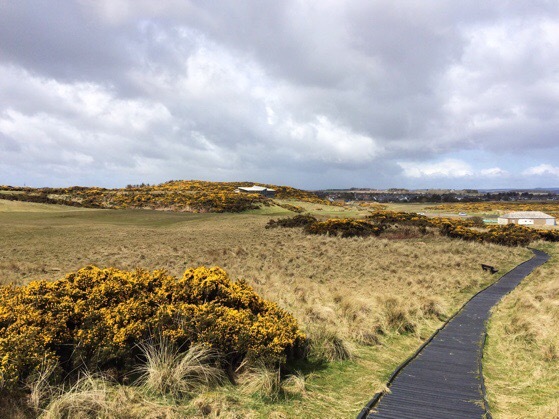 You drive down Beach Road and pass the golf course and then you can park and walk over the dunes to see the seals. It’s a gorgeous beach but every time we go it is crazy windy. We went to Newburgh recently though and the yellow gorse is so lovely right now. Except don’t get yourself in a place where you have to bushwhack through it. Take it from me, it’s real prickly. 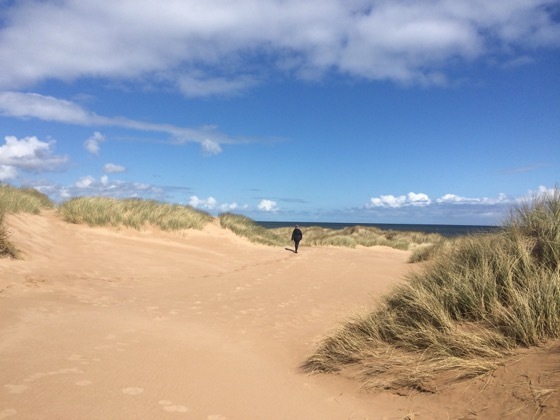 You can also park at the Forvie Nature Preserve and walk through all kinds of sand dunes. If you go south you will eventually reach the Newburgh seals and if you go north you will get to Collieston. 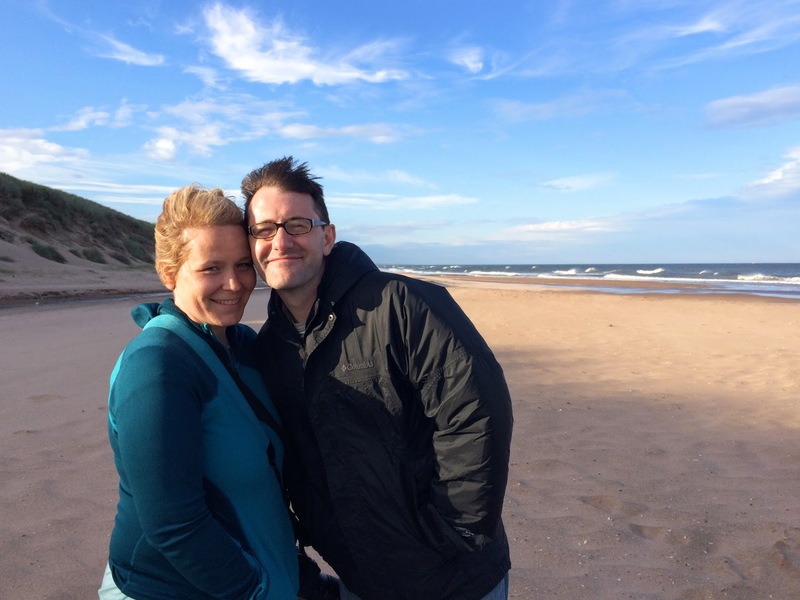 Either way, you are winning at seeing beautiful sand dunes in Scotland. Another spot to see some gorgeous dunes and walk along a beach is just north of the mouth of the Don River in Aberdeen. There is a place to park along Donmouth Road, and a path that leads down to the beach. I find this spot particularly lovely during low tide. Probably the dunes we visit the most often are at Balmedie Beach. 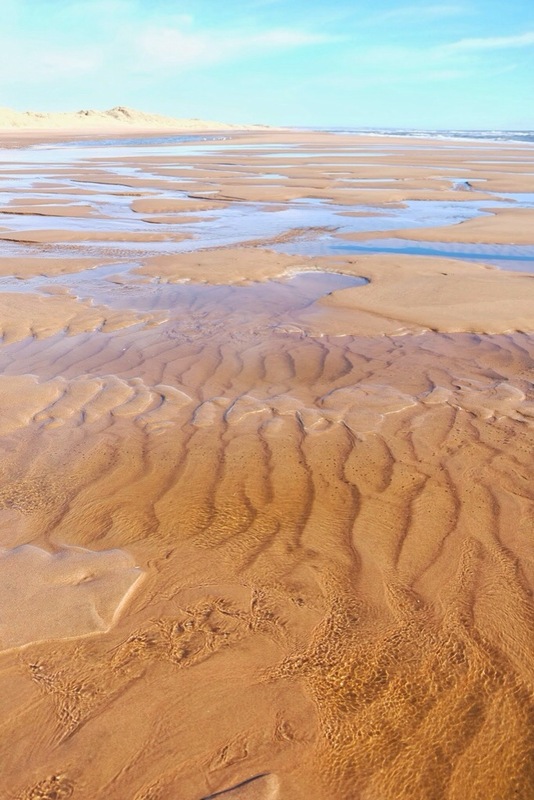 Balmedie is only about fifteen minutes away from us and we love it in all seasons. And in almost any weather. It is beautiful in the mist. And on a sunny day you will think you’ve landed in heaven. Except then you might think that it is perhaps a little cold to be heaven. Also at Balmedie is the boys’ favorite big sandy hill to run/slide/box sled/roll down. 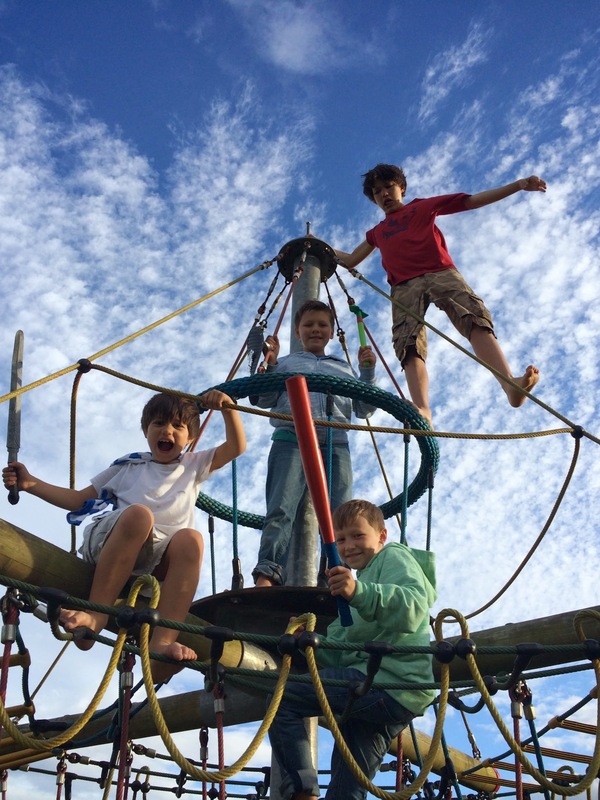 And near the parking lot is a darling playground with a pirate ship. 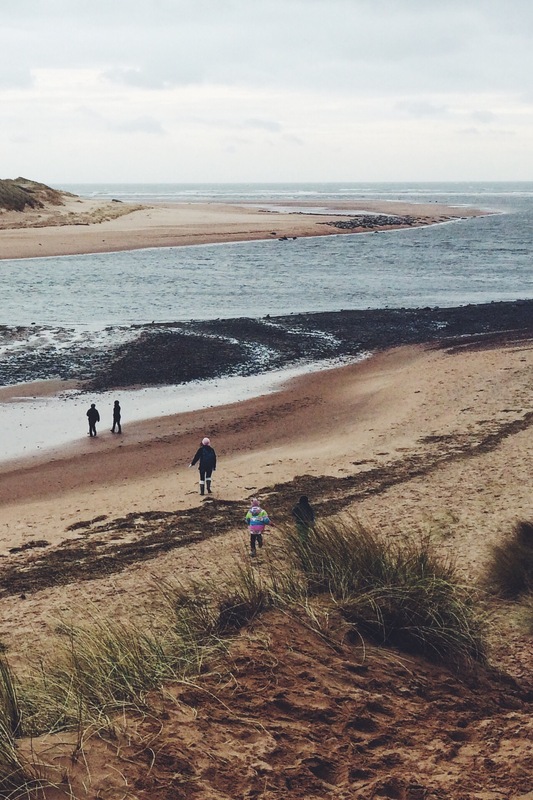 So at Balmedie you can play at the beach, on the sand dunes AND at the playground. So. Many. Choices! 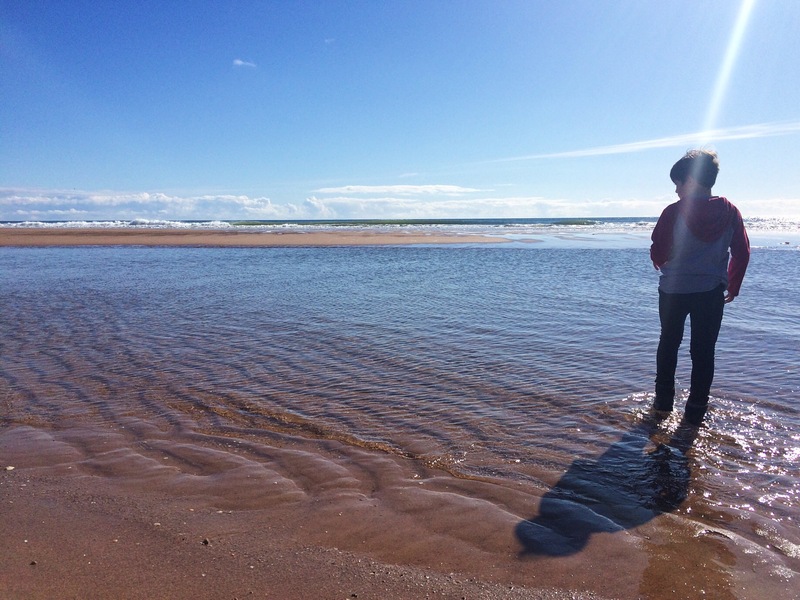 We almost always end up leaving Balmedie because we’re all cold and have to go home and get warm. In fact, I often think that if it was a warmer or less windy day that we could stay forever. I recently tested this out with a friend of mine when we happened to go on what I think was maybe “the most perfect day ever to be had in Aberdeen.” We get one or two of those days a year (I exaggerate. We get really get four.) and so we ran out to Balmedie to make the most of it, planning to stay for a couple of hours. OVER SIX HOURS LATER, we said, well I guess we are going to have to load up and go home because you know, life. And we had eaten everything we had. But the kids played so hard for so long that I felt like we could have been there for a week. At one point, children were stripping off all of their clothes and running naked into the water, and even though I was still in a coat and hat, I wondered for a minute if we’d been transported to the Caribbean. It was glorious. 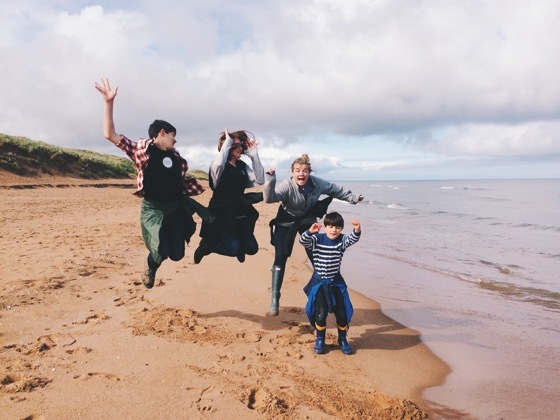 We’ve taken loads of visitors to Balmedie over the years so here are a few fun memories for cold trips to these sand dunes and beach. In June 2014 with my friends Jermaine and Kristie. In June 2015 with Bailey. In May 2015 with Rhonda and Carol. In July 2014 with Campbell and Wilson. Are there other places to play in the sand dunes in the UK that you would recommend? Do tell me because you know how I love a road trip to a new place to see the sea! PS A cafe is opening at Balmedie next to the playground sometime soon. So that’s just one more reason to go! *YES! It will almost always be windy! And in North Devon at Braunton Burrows (http://www.brauntonburrows.org). They might do for starters! The sea and the sand are always changing aren’t they? I think that’s one of the reasons why us British (and Irish) are so fond of and attracted to our long, beautiful coastlines. Sometimes, visitors who come from places in the world that aren’t close to the sea don’t get it at first, but usually, after a couple of trips to the seaside, they do. Very fun! This is a great list! We are hoping to get down south and to Wales in the near future so I will definitely take these recommendations along! We do love the seaside! It’s been such a special part of our time in Scotland!